I've been seeing the surreal blurry/elongated tree technique getting really popular for forest images and I've been wanting to explore along those same lines but try to find a unique minimalist approach. This impressionistic take on these trees is the result. 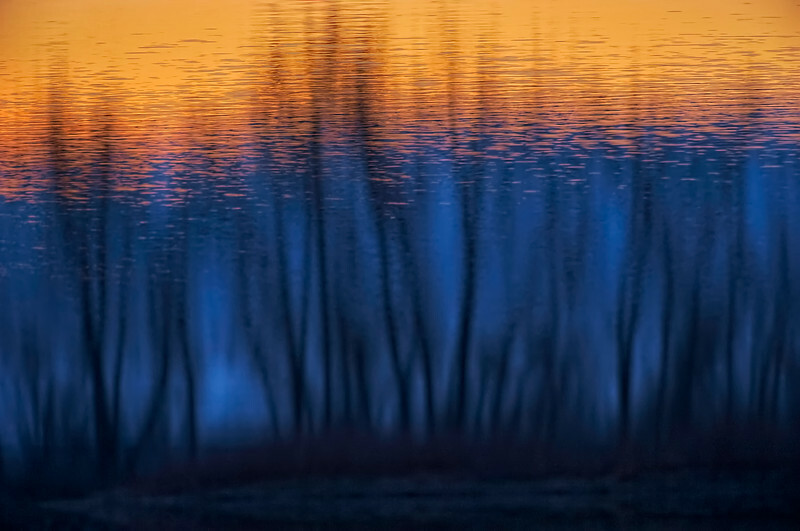 The image is of trees reflecting at blue hour into a lake. Image Notes: To make the image I used a long lens from a distance to compress the scene (300 mm with 1.4x on D300) and waited for the sun to set. Once it was blue hour I was positioned across the lake and focused on the dividing line between where blue hour was dominate and the region where sunset colors still permeated. The only big thing in post was to flip the image vertically. I can imagine this is heavily reliant on wind patterns and would expect slightly different results each time. I hope folks likey!